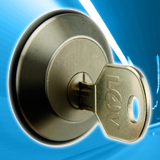 Thatcham Approved Slamlocks, Dead Locks, Diablock - Safe & Sound cater for all additional van lock security & protection. As the name implies a slamlock automatically locks and secures as the door is closed, requiring the use of the legitimate key to regain access. Due to the automatic operation of a slamlock they are recommended for load area doors and are Ideal for multi-drop situations. 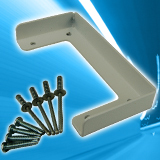 Upgrade and convert the standard vehicle locks fitted to vehicle load doors, to genuine slam operation. This kit replaces the manufacturer’s vulnerable barrel and internal mechanism with High Security custom designed products, designed to resist attack and tampering. 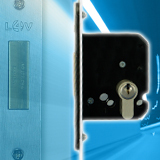 The Locks 4 Vans deadlocks have an internal mechanism which only ‘lifts’ when the correct key is being used to unlock the device, this prevents the lock bolt being pushed back into the lock case. Cheaper ‘deadlocks’ often rely solely on the actual key barrel to provide ‘deadlocking’, resulting in a much lower level of security. The Cable Guards provide a machined protective shield, designed to shield the rear door wiring loom from attack by thieves. Thieves have discovered that if certain wires in the rear door loom are cut, this unlocks the doors giving immediate access into the vehicle. This means not only have you lost the vehicle contents, but you cannot lock any doors until the loom is replaced. The Cable Guard prevents the wires from being cut. Fitting this low-tech but highly effective security device is extremely cost-effective or perhaps you would prefer to take the chance?